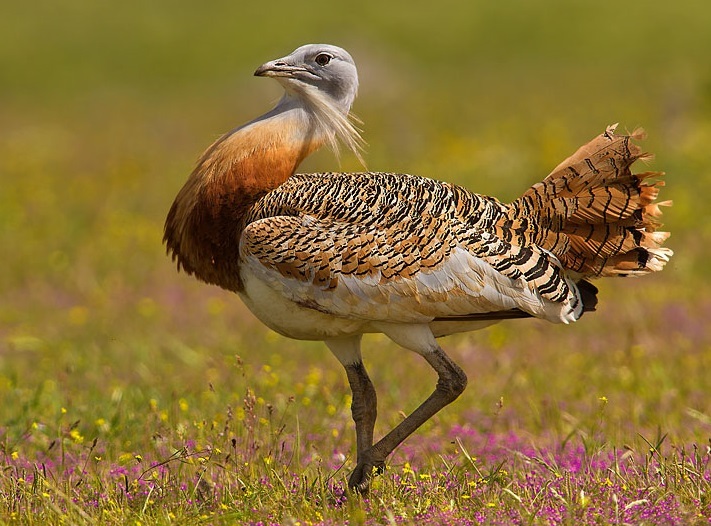 Delegates from 13 European countries on Thursday agreed on transboundary conservation measures for the great bustard - the heaviest flying bird in Europe. Germany is one of the signatories to the agreement concluded under the Convention on Migratory Species (CMS), also known as the Bonn Convention, to protect the Middle-European population of the species. CMS and the Brandenburg State Office for Environment organised the meeting with support from the Society for the Protection of the Great Bustard. The globally threatened species prefers an open landscape. The best habitat for the bird in Central Europe is open, unfragmented and non-intensively used agricultural fields with a high proportion of fallow land. Intensive agriculture and infrastructure projects have been the main cause of the decline of the great bustard populations. Barriers such as afforested areas, shelter belts, railways, roads and fences tend to fragment their habitats. The great bustard’s tendency to make low and short-distance flights makes it difficult for the birds to avoid such hazards. The construction of new highways and railways poses risks of fatal injuries. Many birds collide with power lines, the most significant cause of mortality in bustard species worldwide. All infrastructure measures should be subject to environmental impact assessments so that viable alternatives can be considered. Existing power lines across great bustard areas should be buried or marked prominently to reduce mortality. Disturbance drives the birds from ideal breeding and feeding habitats. Reduced breeding success, changes in habitat and lethal injuries from collisions decrease survival chances of populations. Without appropriate conservation and management measures, these combined threats will result in an overall population decline. Great Bustards need protection from disturbance and other threats. Protected areas, strong legislation, less intensive farming without use of pesticides, and prior assessments to evaluate the environmental consequences of proposed plans are the building blocks of the new guidelines that have been adopted. The birds require immediate action to better protect their breeding sites from agricultural activities or other disturbances. Collecting and analyzing data of ecologically significant areas helps to minimise conflicts. Monitoring will provide more information on movements and mortality factors.